Here’s a WIP of a really important project we’re working on right at this moment. 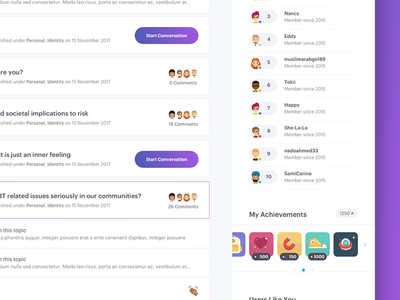 This shot is of a small part of the interface for a platform that provides an open space for people in the Middle East to freely speak and debate LGBTQ related issues. Limited preview for now, but as always… more to come! Can’t wait to show you! Avatars courtesy of Get Avataars, an Avatar generator that will be used within the platform.